Yes, it’s another tower defence game. It seems that you can’t move in gaming circles these days without tripping over one of the bloody things every couple of steps. Waves of enemies spawn at one end of the map, and your job is to place your “towers” in a such a way that they all die before getting to the thing you’re trying to defend at the other end of the map. Towers can be upgraded to do more damage, enemies get gradually more powerful and more numerous as the map goes on, yadda yadda yadda. So far, so conventional. 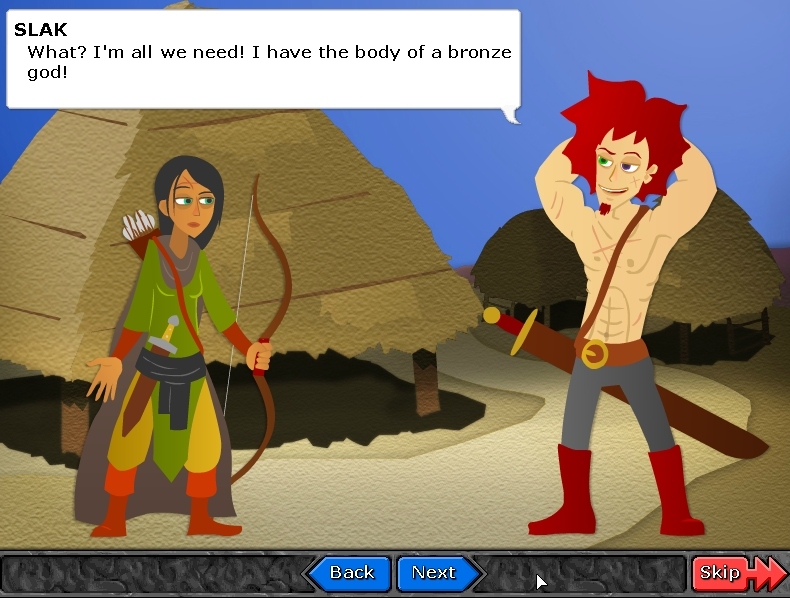 But Defender’s Quest is anything but conventional. You see, you don’t actually place towers as such. You place people; people who are based off of typical fantasy RPG tropes – fighter, archer, knight, healer and so on. They’re immobile and they have a limited range so they have the same basic functionality as towers, but they differ from towers in one important respect: every character you place is unique, with its own separately-tracked experience gain and skill tree which they level up just like an RPG character. They can also be fully customised in terms of name and clothing colour so that you can easily tell your six tiny sprite-berserkers apart in the heat of the moment. This lets Defender’s Quest do some very, very neat things. There’s six character classes and you can have six of each, and every class fills a particular defensive niche that makes it effective against a particular bad guy. The enemy waves are pseudo-randomly generated and can have any combination of the following qualities: basic, fast, fighting, armoured, dark, ranged, water-crossing, spawn. Berserkers have a high damage output that hits many baddies at once but are hampered by a short range, so they’re best against large groups of weak enemies that can be dispatched quickly, and worst against armoured and fast enemies. To kill armoured monsters you first have to hit them with a knight’s armour-piercing attacks; this permanently destroys a creature’s armour so that other characters further down the line have a chance of damaging it when it gets to them. Fast enemies need to be countered with the ice mage’s slowing attacks; dark enemies with the healer’s Holy Light and Ether Flash spells. Rangers are a jack-of-all-trades – they do a little bit of armour piercing, have rapid attacks and a long range, but don’t do that much damage – so their job is to supplement the other fighters by taking out the odd baddie that slips through the defences and wearing the rest down by constant attrition. All the units you can place are specialised to fulfil a specific role, therefore. However, the skill trees and rudimentary progression the RPG mechanic adds to the game allows some specialisation within that specialisation. You can upgrade a berserker to attack more quickly, but that’ll mean neglecting his extra regeneration ability – which is important when berserkers can’t wear armour. Healers can be levelled to the point where they provide a temporary damage boost to all nearby characters; rangers get the aforementioned armour piercing as well as a poisoning effect for extra damage over time, and dragons get the appropriately-named “NOM” ability which lets them instantly kill baddies who have dropped below a certain level of health. It’s very well thought out, and means unit placement in Defender’s Quest requires a little more thought than your average tower defence game. 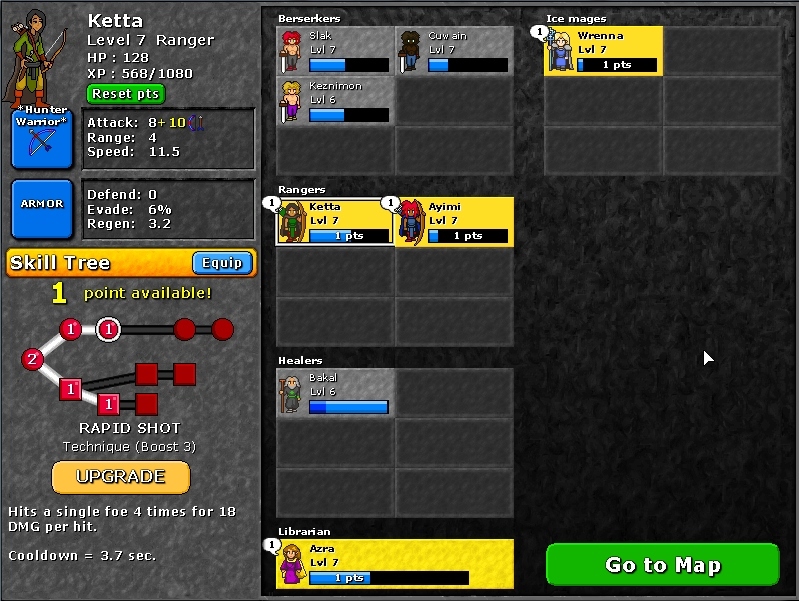 This is compounded by the way the RPG mechanic allows the developers to approach in-battle unit upgrades. Usually it’s a case of upgrade = more powerful/quicker attack, which is a somewhat boring if easy-to-understand way of doing it. In Defender’s Quest, since the individual units are all upgrading anyway thanks to the levelling they do in the metagame something a little different is called for. A basic level one unit will have access to just one attack which hits a single target quickly. As they level in the metagame, though, they get access to additional attacks which recharge slowly, but which hit more people for more damage than their regular attack. These will be locked off when the unit is first placed on the map, but once some mana is invested in “boosting” the unit to level 2 they’re able to use a second attack. Level 3 enables a third attack, level 4 a fourth attack and so on, and the crucial thing here is that all these attacks recharge independently; a level 5 berserker will still be hitting with his basic attack at the same rate as level 1 berserker, but he’ll also be laying down the pain with four additional attacks as well. This makes the damage difference between a basic level 1 unit and a unit boosted to the maximum level 5 far more dramatic than it would be otherwise. In fact the cost to upgrade a unit even once will be several times the amount you pay to put it on the map in the first place; this high price reflects the way they exponentially improve in effectiveness with each additional upgrade level. And thus Defender’s Quest isn’t so much a question of scraping together money to buy new towers – you could quite easily put down every single unit you owned with your starting cash if you wanted, although you’d then go on to lose the map because they’d all be rubbish – but instead it’s all about what you upgrade where and when. 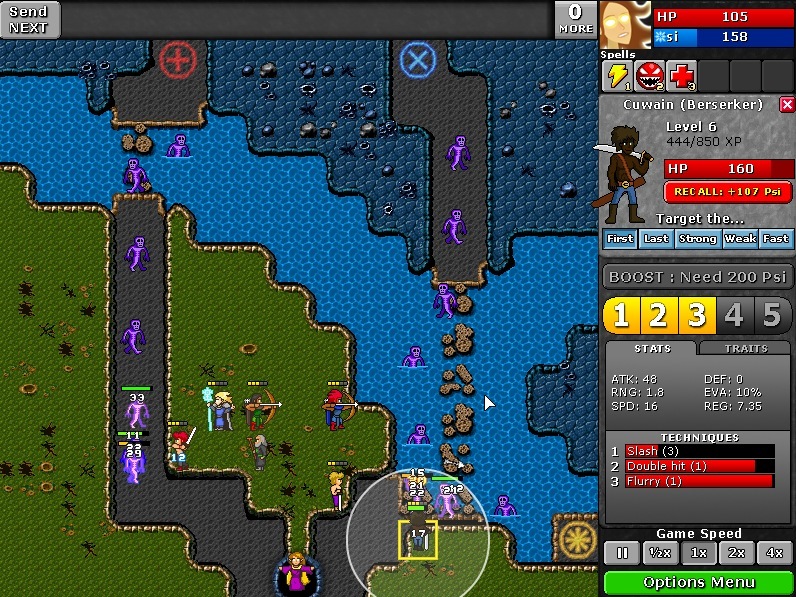 This and the different varieties of enemy that can be encountered are enough to make Defender’s Quest a Good Game, but it goes further than that by adding abilities for the player to use that are actually useful (indeed, a well-timed Frenzy can make or break a level), excellent music and a plot that is, if not exactly stellar in quality, at least serviceable. I definitely appreciate that they made the effort. Best of all is that the developers have bent over backwards to make the game accessible to as broad a range of players as possible. Can’t do a level? Go back and get some experience by trying an earlier one on a harder difficulty setting. Aren’t getting enough experience? Whack experience gain up via the game options. Don’t want to sit through a cutscene? Press the skip button. There’s an amount of customisability here that I really respect; it’s a game that wants you to play it the way you want to without feeling like you’re copping out. If Defender’s Quest has a flaw – and I am kind of nitpicking here – it is that the presence of the RPG mechanic means that the developers haven’t had to think so much about balancing their difficulty settings – after all, no matter how hard a level is you’ll eventually become strong enough to beat it, so they obviously felt it was appropriate to stick some really, really vicious ones in there. Beating the game on Advanced requires you to – hnngh – actively grind experience in the single Endless level, while I’ve yet to finish it on Expert despite being quite sickeningly overlevelled at this point. If you haven’t got enough experience to finish a level then all the tactical placement in the world won’t carry you through it. I’m not sure I particularly agree with this approach to difficulty, but then I’m not sure how else they could have done it. The base difficulty level is at least appropriately paced as long as you don’t obsess over getting a perfect rating on your first runthrough, so while I don’t really like it I can at least live with it. 2012 seems to be the Year of the Indie Games for me. The number of worthwhile triple-A releases on the horizon is laughably small (it currently stands at four barring any surprise announcements) but given the generally dire quality of most of the games I bought last year indie games taking up the slack might be no bad thing, especially if they’re all as good as Defender’s Quest. It’s probably not the best one I’ll play this year – it lacks the brainbox genius of something like SpaceChem – but it is extremely well designed and a pure pleasure to play. And even if nothing else is released this year which surpasses it, Defender’s Quest at least ensures that I’ll remember 2012 for something. Enjoyed the demo, but I don’t think I have the time to get through it at the moment. Will come back to it, I think – quite liked its approach!